Nothing has revolutionised the marketing landscape more in recent times than the smartphone. But as marketers continue to realise its value, it’s getting tougher to get your brand’s message heard in an increasingly noisy market. According to research by Microsoft, consumers can be exposed to as many as 600 messages or signals a day from brands hunting ears, eyeballs and, ultimately, wallets and purses. 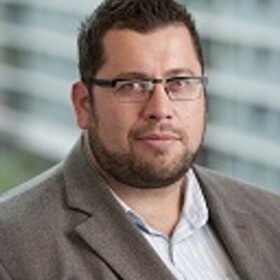 Chris Wallington (pictured above), Segment Lead for Microsoft’s Search Advertising in Australia and New Zealand, says this combination of both push and pull signals can overwhelm consumers and waste marketing dollars. Thankfully, Wallington says, search has fundamentally moved on from just “10 blue links on the page”. And the technology’s already here – Cortana, Siri, Bing, Google – allowing users to speak a command and get the right response, feedback and results. Search as a medium plays across the consumer decision process, allowing individuals to cut through the clutter and get to the information they want and need. “It will continue to play an active role and create efficiencies in task completion based on intent. Personal digital assistants such as Cortana continue to drive the evolution of search and the task completion experience,” says Wallington. He uses the simple example of choosing to see a movie. We’re already using search for the basics (times and tickets) and complimentary experiences using suggestions such as transport options or nearby venues for dinner or drinks. But search also provides a point of validation through reviews, social media (what friends and family thought of the film), and by learning about our behaviour search can evaluate alternative options based on our past viewing habits and experiences. “The search experience will learn what you like, where you choose to make a purchase, understand how you prefer to pay in a given situation and what you might like to do next”. To enable these experiences the future of search is totally dependent on data. “Data is evolving; as it powers intelligent machine learning, which in turn, delivers increasingly better experiences. When we talk about data, it’s hard not to think about our privacy at the same time. People want a better experience, but privacy remains ever important to consumers. Consumers need the ability to understand and control their privacy options, make meaningful choices about how and why data is collected and used. As marketers there is a responsibility to ensure consumers have the information they need to make the choices that are right for them,” he says. Ultimately, the growing quantity and quality of data intelligence improves the decision making experience. So while your customers (who are spoiled for choice in this day and age) might be receiving 600 messages a day, when digital search is done well, it should cut through the clutter with relevant messages that invoke desired actions. Search should be the first tool in the kit-bag of any savvy digital marketer.